Extreme heat made for tough conditions on Day 2 of the Road World Championships in Doha, Qatar, on Tuesday. 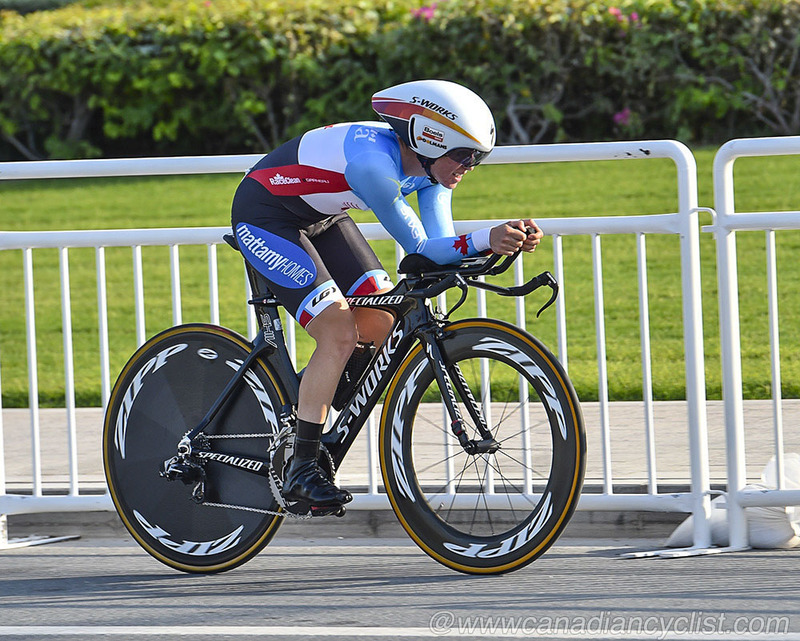 Nickolas Zukowsky had a top-25 ride in the Junior Men's time trial, while Karol-Ann Canuel was 19th in the women's. With temperatures approaching 40 degrees Celsius before humidity was factored in, athletes struggled in the time trials held on The Pearl Island offshore of Doha. Zukowsky, who is new to road racing this season from mountain biking, had a strong ride in the Junior Men's 28.9 kilometre time trial, finishing 24th, with a time of 37 minutes and 34 seconds. Zukowsky began conservatively and was 35th after the first split, but a strong second split, with the 16th fastest time, moved him into the mid-20s, and he managed to hold that position for the rest of the race. Matthew Staples suffered some bad luck on his ride, when a mechanical on his time trial bike forced him to switch to his less aerodynamic road bike for the second half of the race. Staples finished 64th. Brandon McNulty (USA) won the world title. "I was a bit disappointed at first," said Zukowsky. "I could barely believe the time Luc [Arseneau, coach] gave me in my earpiece; I did not think that I had done that well. When I reflect on it, it's very satisfying to think that it is actually only my first year of road biking. It's been a great year, and I'm looking forward to jumping into Under-23 next year." Staples admitted to being disappointed with his result, "Being at my first Worlds in this heat, and with the stress and complications of the time trial ... a lot of factors contributed to making this a hard race. The bike change was disappointing and in any other race I would have been a DNF. But, with this being the world championships, stopping never crossed my mind." In the Elite Women's race, Canuel was Canada's only entrant. 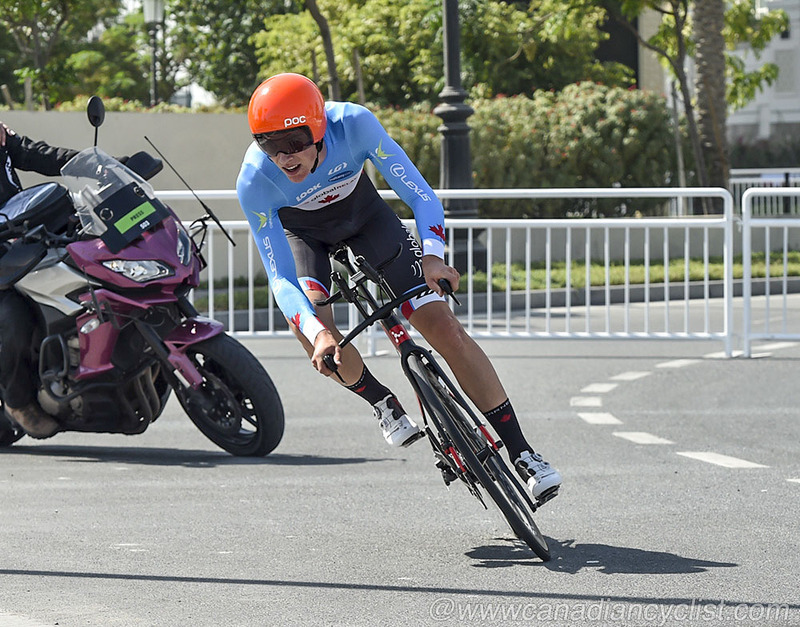 Possibly still suffering the effects of the world championship title ride in the Team Time Trial on Sunday, Canuel rode consistently in the high-teens throughout the 28.9 kilometre race, finishing with a time of 39 minutes and 25.66 seconds. Amber Neben (USA) won the world title. "I'm not very happy with my race. I would have liked to do better, but I was not (feeling) good today, "said Canuel, who won the gold medal in the team time trail with her teammates from Boels Dolman on Sunday. The world championships continue on Wednesday with the Elite Men's time trial. Canada has two entrants in the race - Hugo Houle and national champion Ryan Roth.